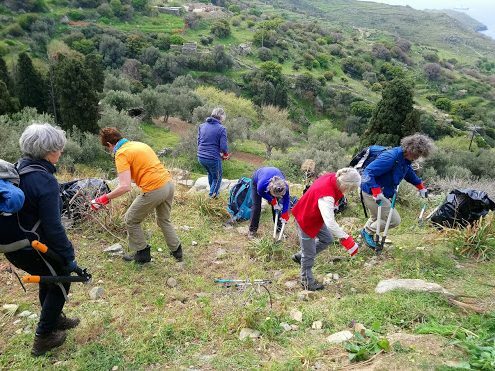 The 5th consecutive Dutch volunteer trip, a cooperation of the SNP travel agency and the Andros Routes project, was completed on Thursday, April 5, 2018. Judging by the emotions of the volunteers on the day of departure, their Andros experience again touched hearts. 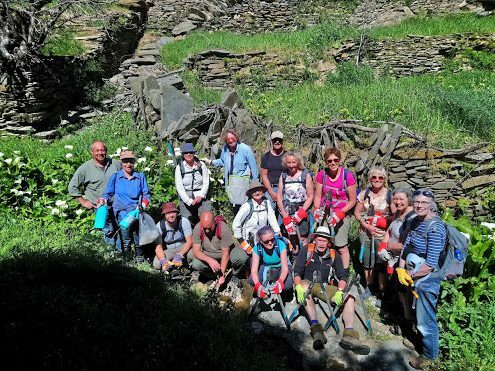 The group who came to help us maintain the trails were 11 women and 1 man and they travelled to Andros, without knowing each other beforehand, from different parts of the Netherlands. They arrived on our island on Friday, March 31, and stayed in the area of ​​Hydrousa for the first 2 nights. On arrival they sat down for a lovely meal at the Hala family’s “Three Stars” restaurant in Gavrio, where they met the members of the Andros Routes team and were briefed on their activities for the next few days. 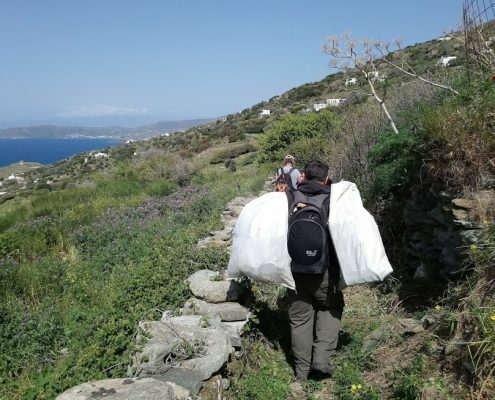 The next two days were dedicated to working in the area of ​​Ano and Kato Aprovato where they completed the opening of a new circular route, which had already been cleared through the volunteer work of Yannis, Nicole and Stefanos Christopoulos. On the first day of work, the volunteers’ lunch was provided by the Kokkini bakery in Gavrio, and an afternoon meal was offered by the Cultural Association of Aprovato with the help of others from the area. In the afternoon the volunteers were guided by Vangelis Loukisas to the St. Peter’s tower. On the second day of work the volunteers visited the archaeological museum of Paleopolis early in the morning and then worked again in the area of ​​Aprovato. This day was combined with our regular two-weekly maintenance hike, and the Dutch volunteers had the opportunity to walk and work with a group of permanent and seasonal Andriot residents. The volunteers’ lunch was provided by the Petrakis bakery of Gavrio, and a meal at the end of the day’s work was offered by the “Balcony of the Aegean” restaurant. In the afternoon our friendly volunteers were transferred to Chora where they stayed for the next 2 days. 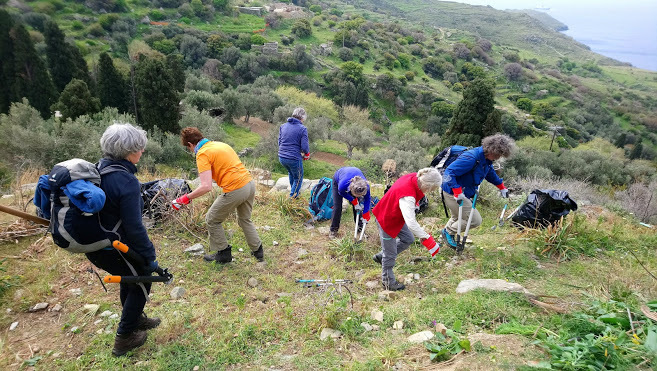 In ​​the Chora area the volunteers worked part of Route 7 leading to the archaeological site of Zagora while also clearing a blocked branch from Route 7 leading to an old and beautiful water source. 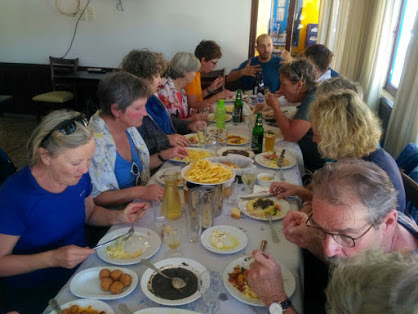 A delicious meal and warm companionship was offered by the Zaganiaris Association at the Koulouri Restaurant in Pitrofos. 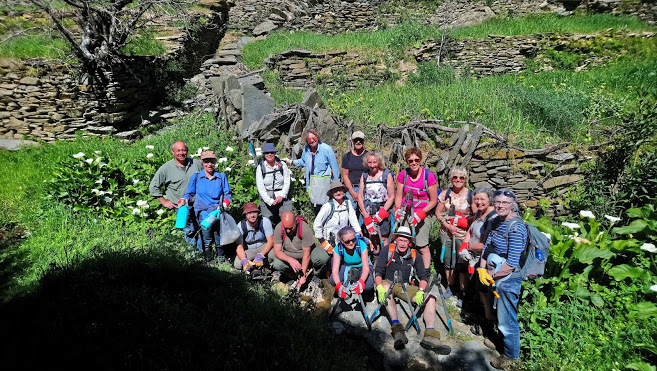 Then the Dutch volunteers enjoyed a tour of the Foros cave in Aladinos offered by the Cultural Association of Aladinos. That evening a showing of the film “Little England” was organised by the company “Little England AE” and the Andros Cinema Club. 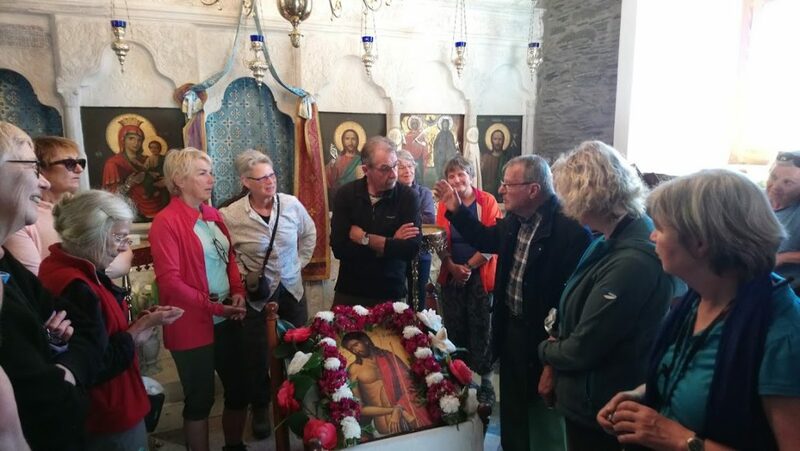 The following morning, after a short walk in Chora, they visited the Monastery of Agia Irini. 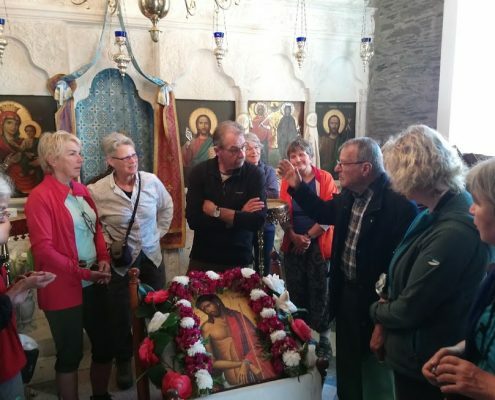 The owner Lefteris Polemis conducted a tour of the beautiful restored monastery, and the three small museum galleries he has created on the site. 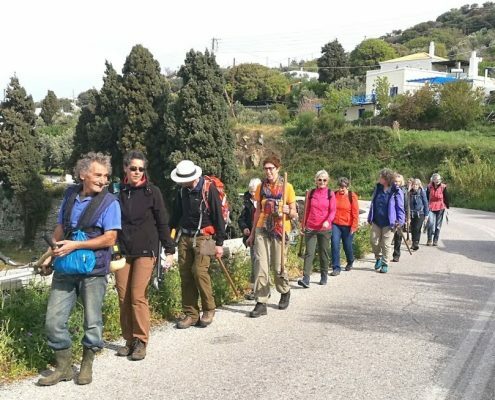 After homemade cookies and coffee, the volunteers were driven to ​​Menites where they walked and worked on part of Route 1 as far as the settlement of Messathouri. This was followed by delicious meal cooked by Efi Raptaki with help from Chariklia Daniolou and Irini Dabasi at Efis’ home in Livadia . Efi took the group around her beautiful citrus orchards. In the evening the group transferred to Korthi where they stayed for their last 2 days on the island. 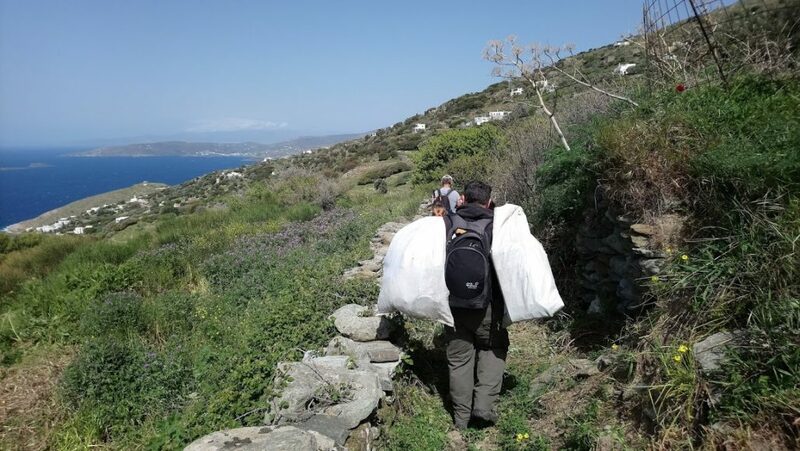 On their first morning in the ​​Korthi area the volunteers cleared an overgrown path to create a new circular route near to Kapparia village. This work was in collaboration with the Kapparia Cultural Association. After working the family of Eirini Robou prepared a lovely meal for the Dutch team at their home in Piso Meria, extending the well-known warm hospitality of the Korthi region. On the final day the Kapparia residents hosted a farewell meal where an interesting discussion between the Dutch visitors and the local Kapparians took place. A parting gift of local sweets was presented to each of the volunteers. 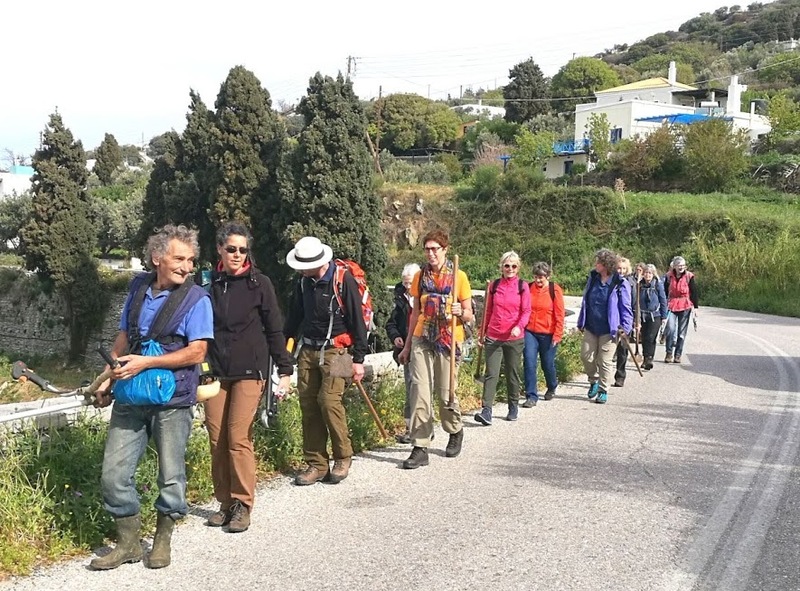 On the way to Gavrio port, our volunteer friends had time for a short farewell walk to visit the newly revealed spring in the Zagora area where they had worked earlier in the week. In Gavrio, the volunteers were treated to refreshments, coffees and sweets in Eftychia’s cafe. To celebrate the trip a presentation of a diploma and a gift was made to each of the Dutch group by the Andros Routes volunteers. The diplomas were designed by Achilleas Kleisouras and the gifts included soaps donated by Eleni Kourtessi of Soap by Eleni. The drinking water for the whole trip was provided by SARIZA. The Municipality of Andros donated the use of a minibus and fuel for the trip. The driver’s cost was covered as part of the volunteers travel package. Our gratitude to all those who helped with this trip revealing our beautiful Andros … a most hospitable island!